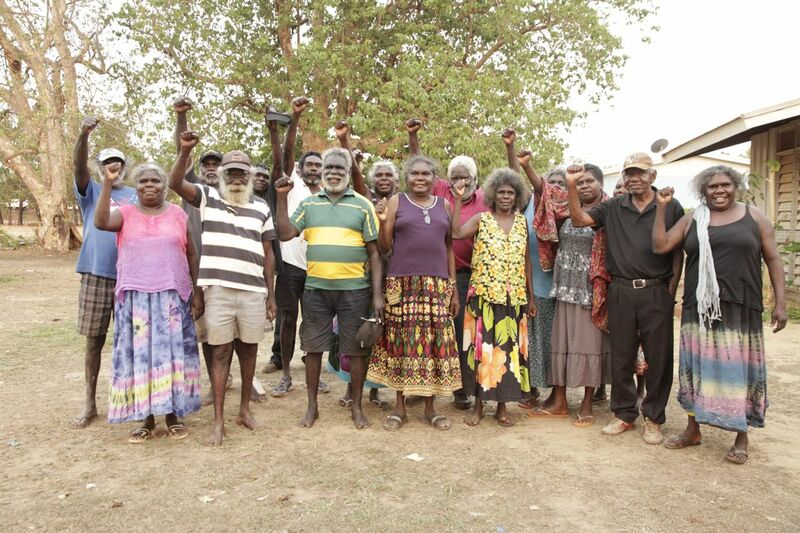 Independently established 12 months ago in Galiwinku, the Yolnguw Makarr-Dhuni (Yolngu Nations Assembly) held its 2nd annual gathering in Maningrida from the 11th to the 13th of October. Male and female representatives from East, Central and West Arnhem Land came together to talk about current and future governance issues affecting their people. 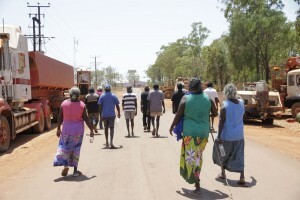 The assembly opened with a march through Maningrida to represent the long walk toward self-management and self-determination. Before the meeting concluded, the group met with the newly elected NT Chief Minister Terry Mills, and member for Arafura Maralampuwi Xavier, to present their position on a number of Federal and Territory Government policies affecting Yolngu communities. The final position statement from the group is below. 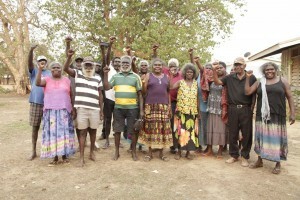 The issues include the Federal Intervention, Shire councils and local governance, Homeland policy and the “Hub towns” model, housing and leases, child neglect, alcohol, education, and fundamentally, a call for a reciprocal relationship between Yolngu Maḏayin law structures and Government agencies. 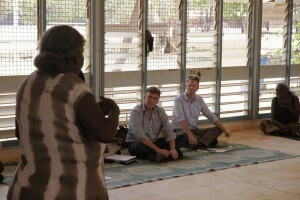 Maningrida: October 11th – 13th, 2012. We want our community councils back and our assets returned. We call for an end to the Super Shires model of community governance, and we want the Northern Territory Government to act on this quickly and in real consultation with landowners and clan leaders in each community. We want genuine empowerment and the jobs we used to have when we were responsible for delivery of our own local services. These are our communities and we want to proudly take ownership of them and nourish them for the future. We want equal funding for all communities, whether they are small homelands or bigger ex-mission towns. We want the “National Partnership Agreement on Remote Indigenous Service Delivery” that underpins the hub-town model to be scrapped. All communities are viable, when they are given the funding to grow and develop. Homelands have been neglected for decades, and they must not be thrown aside. These communities are not “just fishing camps”, they are home to a third of all Aboriginal people in the Northern Territory. Our children grow up healthier, stronger and more confident in homeland communities when they live on country that is related to them through Yolngu law. We want housing for all communities, including homelands. We want the requirement of leases for housing to be withdrawn. We will refuse to sign these leases and we will encourage others to do the same. The requirement of leases is an attack on our land rights and acts like blackmail. The same is true for leases for the Shires. We want to have local, community run organisations to build and maintain housing assets and to be responsible for community governance. We want people from the community to have the jobs that are associated with this. We can learn on the job and our young people would be proud to be part of an organisation run by the community, for the community. We want self-determination. We want democracy. We want the power of the people in Arnhem Land and in all Aboriginal communities to be recognised and our rights respected. We want the Intervention to be thrown out, and we want the Northern Territory Government to lobby the Federal Government on our behalf. The Federal Government must start to listen to the voices on the ground. No more deception, no more lies, we want the Intervention out now and self-determination to be taken seriously. We never consented to this law, and we were never asked if we wanted the continuation and extension of these laws under the deceptively named “Stronger Futures” Act. We will not tolerate this bullying and it is no way to treat human beings. We are being led around like dogs on a lead with the Basics Card, compulsory acquisition of our land, police coming into our houses without a warrant, and having our law disqualified from recognition or consideration in court. All this was done and continues to be done under the lie that we are hiding pedophiles and that child abuse comes from our culture. This is disrespectful, slanderous and fundamentally untrue. It is undermining our law, our culture and our whole identity. All this so Government can get legitimacy to take over our communities. We demand an apology from the Federal Government. We have our own system of law to prevent disagreements from escalating. We keep peace and order through good governance and we have very serious and consistent ways of teaching respect and discipline to all our young people. We have ways of dealing with people who have broken the law that means they are not a threat to the community while they are taught responsibility and maturity. These processes are being eroded through community disempowerment and Government attacks on our legitimacy as leaders and our society as a whole. We want genuine input into the policies that affect our children’s lives. We acknowledge that neglect sometimes happens, but it is not a simple issue of unruly children or negligent parents. Our people are suffering from a deep collective depression due to disempowerment. Our kids can’t see a vision of their own future. Their strong role model old people no longer have waged positions through CDEP and nearly everyone is on welfare with the Basics Card. Since the intervention and the ban on bilingual education, school attendance has dropped because Yolngu children don’t have a familiar school environment, and they don’t see the point in going when all the jobs have gone. This depression is leading to devastation. The self-harm and suicide rate is 5 times higher than before the intervention. These are our children that are paying with their lives for the false accusations and assimilationist policies. This is a pressing issue and it is us more than anyone, that want our children to be safe. We need genuine empowerment to come up with the solutions and to be able to work with children’s and family service providers. Many of our communities were self-nominated dry communities for decades before the Intervention. We refuse to be collectively branded as having problems with alcohol abuse because it was our decision to be alcohol free and we enforce that. A few communities decided to introduce various permit systems that regulate the amount, the strength, and the regularity of alcohol that permit holders are allowed to purchase. People who are found to be abusing this system have their permits taken from them. Our dry areas and alcohol permit systems must stay, this is the responsible will of our people. We want bilingual education to be promoted as the successful program that it was. We want to be able to have independent schools in homelands and larger communities where local law holders, clan leaders and family old people can have influence over curriculum development and school structures. We will be able to address school attendance through communities feeling genuine ownership of schools and the education process. Punishing parents by removing their welfare payments because their children miss a day per week of school will only isolate families from the education system and will mean that those kids have no food to eat. The Northern Territory Government must fundamentally recognize the existence of our Maḏayin System of Law. Our law has always kept the peace in our communities and has always dealt with people that break the law. Maḏayin Law holders are the right people to be dealing with issues in the community because it is based on concepts that the whole community understands and acknowledges. Our law is no longer recognised in court and this not only creates serious problems in the community, it also prevents respected people from dealing with those problems. All police that work in our communities must go through more thorough cultural training to understand the way our law works, and the complexities of clan relations in mission towns, where many clans have historically been pushed into foreign country. There should be local “middle police” that work with NT police so that we can work together to deal with issues in our communities and so police do not seriously offend and damage relationships. Rev Dr Djiniyini Gondarra OAM – Yolnguw Makarr-Dhuni Spokesperson. Mark Yingiya Guyula – Yolnguw Makarr-Dhuni Spokesperson. Well done on getting this on-line. Why has the mainstream media not picked up on it? All power to you in your struggle. I am writing to people in the ABC about it. This is very important, and straight-forwardly written. Why wasn’t it picked up by the mainstream press? Thank you for having it on-line. I am contacting people in the ABC who should be at least reporting it. Well done to all involved… and well done in your struggle, which should be the struggle also of all citizens in this country, for justice.